Suarez and Sturridge formed a potent strike partnership at Liverpool. LUIS SUAREZ HAS admitted that he congratulated Daniel Sturridge for diving against Manchester United at Old Trafford in 2014. Spearheaded by the clinical brilliance of Suarez and Sturridge’s electric pace, the Reds launched a major title tilt in the 2013-14 season, and brushed aside United along the way. Brendan Rodgers’ swaggering side thumped David Moyes’ miserable United 3-0 in a one-sided rout, in which Liverpool were awarded three penalties. Steven Gerrard — whose slip against Jose Mourinho’s Chelsea would later cost Liverpool the title — scored the first two, but was unable to convert after Nemanja Vidic fouled Sturridge in the area. Suarez would later add a third from open play, and has now revealed in his recently updated autobiography that he and the England international shared a laugh over Sturridge’s fall, which led to Vidic’s sending off. “I must admit, I never thought I would see three penalties given against Manchester United at Old Trafford. I certainly didn’t think we would get the one given to Sturridge,” he writes. “He threw himself down. But then it was such a good dive that even I thought it was a penalty. “I saw it and thought penalty. But then I also saw how annoyed Vidic was, which made me think that perhaps it wasn’t a foul. Suarez departed Liverpool in July of 2014, joining Barcelona for a fee of around £75 million, and he has since scored 95 goals in a mere 112 games, but the Reds are finally beginning to thrive in his absence. Jurgen Klopp’s effervescent Reds are currently top of the Premier League, after thumping Watford 6-1 at Anfield on Sunday. It remains to be seen, of course, if the club can go one better than two years ago, when they ultimately ended the campaign two points adrift of Manchester City. Email “'It was such a good dive!' - Suarez full of praise for Sturridge simulation”. Feedback on “'It was such a good dive!' 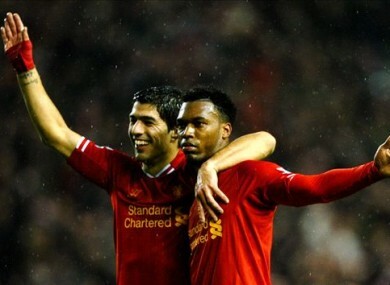 - Suarez full of praise for Sturridge simulation”.